The Sounds of Being healing immersion sessions will allow you to discover your own unique sounds. Phil and Rita Crosbie are SOUNDBEINGS, “the gong people” as they are affectionately known by those who have experienced the power of their work. The Crosbies, who are passionate about the wellbeing of all living things, have a unique medical specialty–sound therapy. 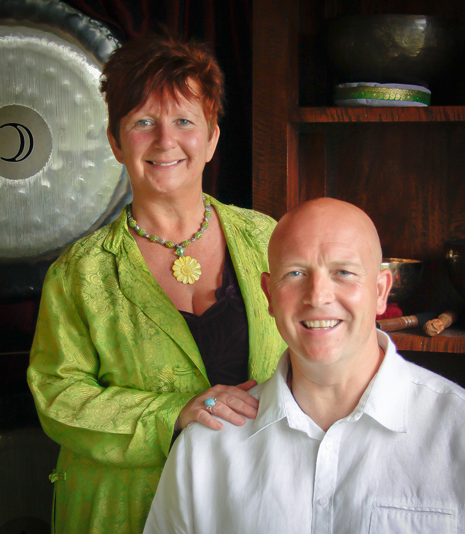 Trained in Europe and the US and members of the Sound Healers Association, Phil and Rita have over 40 combined years of complementary and alternative medicine experience including Reiki [Master], Massage Therapy, Reflexology, Life Coaching and their real passion, Sound Therapy, which they have specialized in since 2006. Originally from Liverpool, England, the Crosbies have worked in professions where they felt they could help people and make a difference: As senior officers within the UK government[police, senior managers in the departments of social care and social justice [immigration and asylum], all while balancing their complementary health care work with their full-time professions. Their dream was to undertake the holistic work full time, live by the ocean and actually have a life. They had always been drawn to Canada and in 2007 were fortunate to travel around Nova Scotia, falling in love with the province. After deciding to follow their hearts and dreams, Phil and Rita immigrated to Nova Scotia, settling in Sandy Point, Shelburne County. Today they work from their ocean-side treatment room and locations around the province, they treat clients come from all walks of life and professions. They have helped people with health conditions including cancer, alcoholism and other addictions, depression and anxiety, and have assisted those who wish to learn to relax or change their focus and to achieve goals and make life-changing decisions.